The Warwick Group has made significant contributions to T2K in all phases of the project: design and construction, commissioning and data taking and physics analysis. Our work has focused on use of the Near Detector (ND280) data to reduce systematic uncertainties and the implementation of joint fits to the muon neutrino disappearance and electron neutrino appearance event samples collected by Super-Kamiokande. The measurement of the electron neutrino contamination of the muon neutrino beam (Phys. Rev. D 89, 092003 (2014)) which impacts directly on the precision of the electron neutrino appearance measurement (Phys. Rev. Lett. 112, 061802 (2014)). The search for electron neutrino disappearance on the baseline of the ND280 which is an important contribution by T2K to help settle the question of whether mixing with sterile neutrino states is playing a role in short-baseline oscillation results: Phys. Rev. D 91, 051102 (2015). Warwick led a measurement of the muon neutrino charged-current quasi-elastic (CCQE) cross section (see plot below) providing a test of the most widely adopted CCQE interaction model at T2K energies of around $1\,$GeV: arXiv:1411.6264 [hep-ex] (accepted for publication in Phys. Rev.). 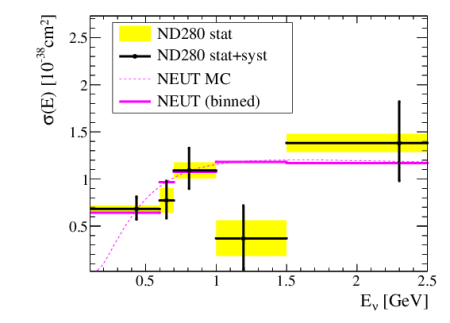 The group has also been leading an analysis of coherent neutrino interactions in the ND280 in which the states of the target nucleus before and after the neutrino interaction are indentical. The basis for this work was the subject of a Warwick PhD thesis and is now in the final stages of journal publication. 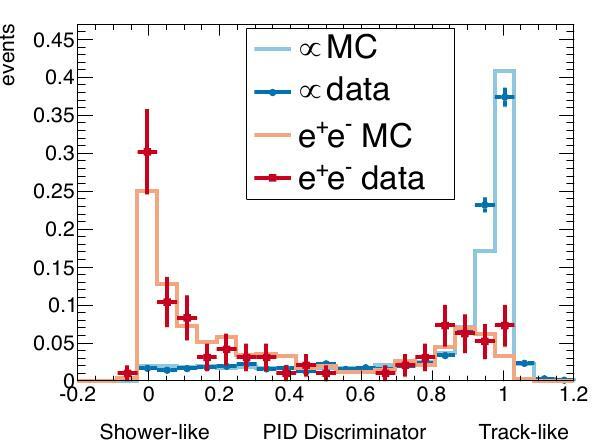 Another aspect of our work in this area has been to drive the model validation more directly, and an example of this has been the implementation of a more physical description of nucleon momenta (the Spectral Function) in the T2K generator and has been reported in a spin-off publication: Phys. Rev. D 90, 093004 (2014). Warwick are also contributing to optimising the ultimate precision with which oscillation parameters can be measured with the T2K data. This has led to the development of a powerful joint fit (known as VALOR) to the combined data set of electron neutrino appearance and muon neutrino disappearance and is reported in: Phys. Rev. D 91, 072010 (2015). When combining T2K data with the results from reactor experiments, the joint fit is beginning to reveal senstivity to excluding certain regions of mass-hierarchy and CP-violating phase. 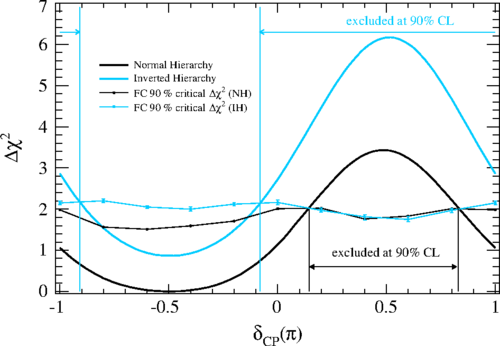 The plot above shows a profiled Δχ2 as a function of δCP with the results of the critical Δχ2 values for the normal and inverted hierarchies for the joint fit with reactor constraint, with the excluded regions found overlaid. The POD ECAL consists of two side modules and four smaller modules on the top/bottom. In 2009/10 all six were assembled in the Warwick EPP lab. Each module contains six layers of scintillator bars sandwiched between lead sheets. Some photographs illustrating the construction procedure are shown below. Each layer was craned into the module and scanned using a radioactive source, testing the integrity of the scintillator bars and the optical fibres within them. The module was then instrumented with photosensors and read-out electronics, cooling pipes temperature sensors etc. We have made significant contributions to the software base for the ND280 ECAL covering: simulation, calibration, reconstruction algorithms and PID. Some of this work is covered in the following publication: JINST 8 P10019 (2013). The plot below shows the discriminating power of a Warwick-developed method for separating electrons from muons. All of the scintillator-based subdetectors in ND280, including the calorimeter modules, are read out using Multi-Pixel Photon Counters (MPPCs). T2K represents the largest scale deployment of these sensors ever implemented. Below is a photograph of the sensor together with the connector system which electrically connects and locates the sensor with the optical fibres. This was part-developed at Warwick in conjunction with Colorado State University. Warwick also took a lead role in the quality assurance of the MPPCs for the ECAL and were one of the main authors of the detailed simulation of the device characteristics which has contributed to make the use of these sensors an unqualified success. Details of the simulation can be found in: Nucl. Instrum. Meth. A656 (2011). The plot below shows the excellent level of agreement achieved between the simulated response and the data.